Romance, femininity, flowers and playfulness - these are just some of the attributes that are captured in this luxury Pink Moods fragranced candle. Pink is renowned as the universal colour of love, both for oneself and others, and this luxury scented candle, with elements of rose, bergamot and patchouli, perfectly embodies this enchanting colour's romantic edge. 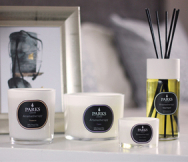 At Parks, our experienced fragrance developers have poured a carefully selected medley of scents into the Pink Moods candle, capturing the essence of pink in a pure wax blend. The result is a balanced feminine fragrance, emboldened by the musk of patchouli. It is expertly finished with top notes of rose and bergamot for the ultimate in romantic home fragrance. Few scents inspire love and romance better than rose. This Pink Moods candle is reminiscent of a sweet and endearing bouquet of roses, freshly cut from a blooming plant in a warm, summer garden. Complementing this iconic sweet fragrance are patchouli, which provides a rich and decadent base from which the rose can really soar, and bergamot, a fresh citrus note to provide lift and sparkle to the rose. Part of our exclusive Moods by Parks collection - a series of exclusive fragrances defined by the mood-lifting properties of scent and colour - the Pink candle offers a unique and enchanting fragrance that embodies a sense of romance, innocence and love. The combination of the candle's all-natural wax blend and our innovative clean burn technology helps to deliver up to 50 hours of this true, long-lasting scent.